It's been over 8 years since Concept2 launched a new performance rowing monitor. The new PM5 monitor looks very similar to the previous PM4 model. However, looks can be deceiving and when you look closer at the specification, the PM5 has many new useful features. Fast Start-up - No waiting. New super bright back-lit display. New data storage options - Use your own USB flash drive to store your workout information. When we first tested the new PM5 monitor, one of the most distinct differences we noticed was the speed that the monitor started-up - It was instant. When compared to the PM4, there was no waiting for the monitor to boot-up and we could begin our workout as soon as the monitor was switched on. The new PM5 monitor has a super bright backlit screen. In our test we found the screen visibility to be superior when compared to the older PM3 and PM4 models. The internal memory in the monitor. The internal memory has been increased so that it can now hold data on 1000 workouts. This is a considerable increase over the previous monitors that could only hold data on up to 10 workouts. One of the main advantages of storing your workout data on a removable USB drive is that it gives you the ability to keep track of your workout no matter what machine you use at the gym. After your workout you also have the ability to upload your workout data to your laptop or PC using the Concept2 utility software. The inclusion of ANT+ and Bluetooth Smart in the PM5 monitor adds the ability to measure your heart rate through a wireless heart rate strap. This adds another layer of data that can be analysed using the PM5 monitor during your workout. This will ensure you are effectively keeping within suitable heart rate training zone during your rowing sessions. Concept2 have added two new games to the PM5 monitor: Darts and Target Training. This brings the total number of games on the new PM5 monitor to four. We found the games to be interesting and added some fun to our workouts. There are some real benefits of upgrading to the PM5 monitor. 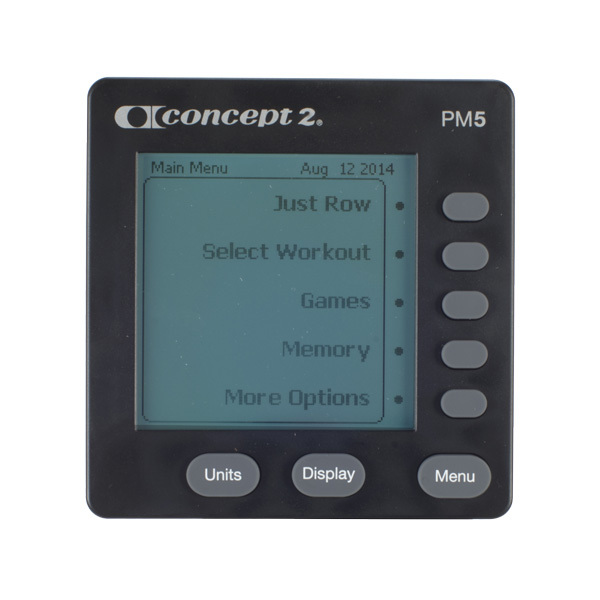 The product designers at Concept2 have added many new features that make an already polished rowing machine monitor even better. We highly recommend the PM5 monitor, not just for seasoned indoor rowing fanatics, but for novices new to indoor rowing as well. This entry was posted in Knowledge & Advice, Product Reviews on 11th November, 2014 by Craig Fleming.